Welcome to Stop 43 and Chapter 43 of the Consequences Audio Tour! If you’re in a hurry to listen to Chapter 43: VIOLATION, run to BOOK SNIFFERS ANONYMOUS RIGHT NOW! Me: Run run to BOOK SNIFFERS ANONYMOUS to find out! There are extra special games and prizes on the host’s blog today AND the key to unlock the password protected chapter–but if you’ve got a few minutes to spare, let me introduce you to BOOK SNIFFERS ANONYMOUS—the blog that forces you to answer the question… are you a book sniffer? She attended her first RT Booklovers Convention in Las Vegas in 2016—I hope to meet her in person in Reno in 2018! In the meantime, I am so grateful she accepted my invitation to be part of the Consequences Audio Tour, and I hope her readers enjoy the VIOLATION chapter… in which Elizabeth has an epiphany, of sorts. 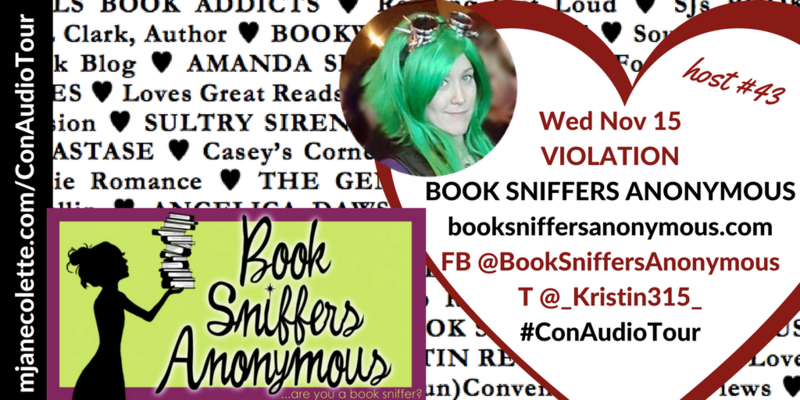 Thank you, Kristin and BOOK SNIFFERS ANONYMOUS! Now–run, run RUN to the blog to experience Chapter 43: VIOLATION!